The New York City Police Foundation is a non-profit 501(c)(3). All gifts are tax deductible to the fullest extent of the law. The Better Business Bureau recommends that an organization spend at least 65% of all expenses on program activity. 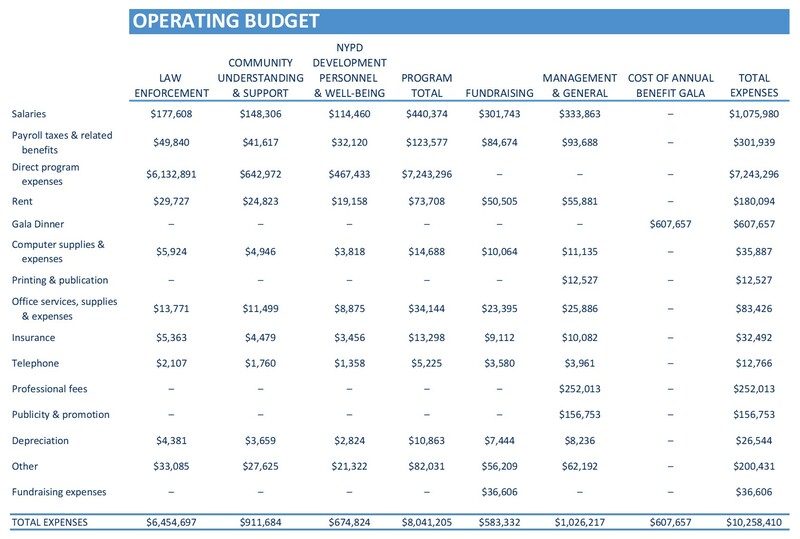 In Fiscal Year Ending 2017, the Police Foundation spent 78% directly on its program services. For a copy of the Foundation’s latest 990 Form, visit the GuideStar link below (free registration is required). The Police Foundation participates in the Better Business Bureau Charity Seal Program and is known as a BBB Accredited Charity. This stands as an immediate and easily recognizable symbol to donors that our organization has met the 20 Standards for Charity Accountability. The 20 Standards evaluate charities financial accountability, governance and oversight, effectiveness measures, and fundraising and informational materials. For more information about the Standards, please visit the BBB of New York City website. For the full report on the New York City Police Foundation, please visit: here.